Flexibility and safekeeping housing firearms for Police or Sheriff Departments, Evidence Rooms, or Military Arsenals and Armories. 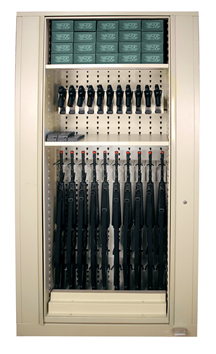 A well planned storage system handles multiple types of firearms and ammunition, maximize space, and delivers rock-solid security. 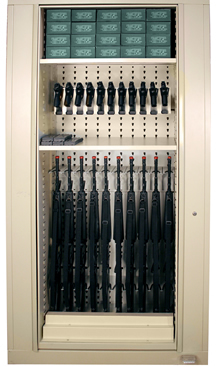 Nationwide Shelving and Automated Storage Solutions provides storage solutions for Weapons Storage. 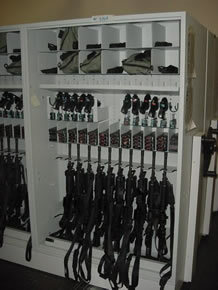 There are traditional and new age solutions for Weapons Storage Racks . We can review the possible solutions with you and determine which is the best value for your department. 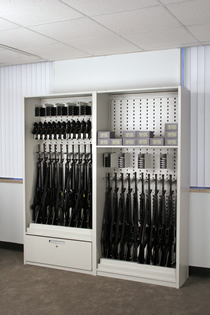 Traditionally we have provided standard shelving and cabinets, but now we also have special shelving just for weapons storage. 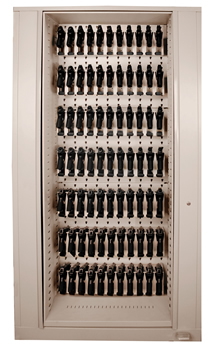 For long guns, hand guns, ammunition and all associated aspects of weapons storage. From a Maze ............. ......................to ...................well.....to Amazing! boxes, and plastic totes for general storage.